One of an occasional blog series on home recording. 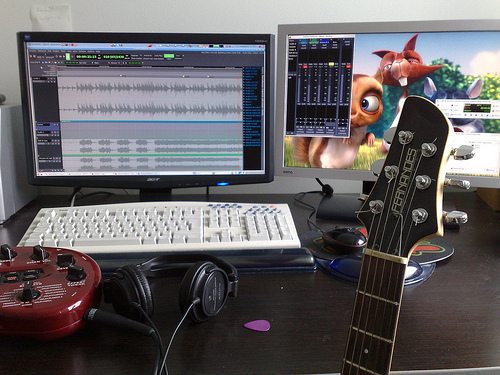 There are very few things you need to make a decent recording of a song at home. Here they are. Of course, a computer is the heart of the modern set-up. It’s so powerful. Obviously, a computer is the most important thing to get, because it will run your DAW software, and you need a way to get sound in and out of it. To handle all these signals coming and going from the computer, you need an audio interface (or an installed PCI-e soundcard, such as an Avid ProTools card). If you can afford a computer, a PC will do very nicely for the lowest cost, whereas Apple are perhaps friendlier in use, but will cost you more money – quite a bit more, usually. Whichever you choose, you want the fastest processors you can find, and plenty of RAM installed. The RAM strongly impacts how well your software performs, so you want at least 4GB on older systems and the more the merrier on the most modern 64-bit systems. If you cannot afford a desktop or laptop, you can get an iPad to work quite well for you, and refurbished first-generation iPads can cope with simple recording sessions. There are multitrack recording apps (scaled-down DAW programs) for iPad so it’s quite possible to make a decent recording of several instruments and a vocal on them. Garageband software comes free for this purpose. When you upgrade later on to a computer-based DAW, the iPad can be repurposed as a remote control surface for the computer’s DAW software, for example allowing remote control of the main DAW’s transport controls (STOP/PLAY etc) by a drummer from behind drums, or letting a singer tweak the amount of reverb in their headphones by using the iPad at the microphone stand. I use an iPad for this all the time. Mine controls ProTools wirelessly from another room. They can also double as useful lyric tele-prompters. Get sounds into your computer by plugging your instruments and microphones into it via an audio interface. This may be in the form of a soundcard already installed in the computer, or it may be standalone. Yours will feature MIC, LINE and HIGH-Z inputs. The MIC is for microphones, the HIGH-Z is for guitar signals and the like, and the LINE level is for signals that have already been through a preamp or are otherwise boosted. High-Z is a way of describing an instrument signal, and just means “high impedance” – which is the type of signal most instruments that use pickups will supply to you at their output(s). This interface input is specifically for this type of signal, and may be called Instr. Input, Instrument Input, DI Input, or High-Z input. These are all exactly the same thing, going by different names. Here’s something critical to quality. The interface exists to convert the audio from analog to digital format. The quality of the converters in the interface determine how good it sounds. Bad conversion gives bad results, as you’d expect. The more you pay for an interface, the better the converters will be, and the better your results from a technical point of view. The conversion is done at both input and output. On the way in it’s an A/D conversion, and, even if it leaves the interface or sound-card as a digital signal, the sound gets converted to analog again in order to hear it through speakers. The converters may be at various points in the chain here on the output side, but typically in a home studio you find D/A conversion done at the interface too. If you take analog signals out of the back of your interface and connect them to an amp and speakers, you have already done the D/A conversion at the interface by using the analog outputs. If you use the digital output of the interface, you will convert elsewhere, most likely in the device you connected to the digital output. The LINE level is the loudest incoming signal, and the HIGH-Z is the quietest. The idea is that all the signals are brought up to the loudest level, LINE level, when they get mixed in the mixer, and then they stay that way. Signals you hear played over your speakers are fed to your stereo amp and speakers (from the DAW) at LINE level, which is what the powered speaker or standalone amp expects to receive. If you have a USB microphone, you can simply plug it into the USB port of your tablet or computer. It will then be available to the software. If you have a traditional microphone, it will have a MIC level output that you connect to the MIC iN socket on the interface or soundcard. It may be a mono 1/4″ jack input or it may be a mono XLR-type input. XLR is best and most common. You will ideally get two microphones. You will need a small-diaphragm condenser mic, and a large-diaphragm condenser mic. The large one is for vocals, and the small one is for acoustic instrument recordings. If you can only get one, I think the vocal mic is the more important one as it can also record acoustic instruments very well. A small-diaphragm condenser is often called a “pencil” mic because of it’s size and shape. You can get both small and large condenser microphones at music stores or online, in all sorts of price ranges. Small condensers also sound reasonable when you are off-axis to the mic capsule (making sounds NOT directed straight at the capsule), whereas large mics are more sensitive to directionality and start sounding a bit hollow or “roomy” as the source gets further off-axis to the capsule (the input end of a microphone you would expect to sing into). This is one reason why small mics often work better than large mics in front of an acoustic guitar – the player moves around relative to the mic positioning, and sounds a bit hollow at times on a large mic because of it, but the small mic can cope better with the player’s motion around the mic, delivering a more even sound. You can also use both mics at once to capture the sound of something close up and far away at the same time, and then you can blend the signals together in your mixer to taste. For instance, you might put the small mic in front of an electric guitar amp at about two inches away from a speaker cone, while putting the big mic six feet away. maybe up in the air six feet or so, facing towards the amp but gathering mostly room reflections due to distance to the source sound. This lets you capture some of the room sound as well as the close-up amp sound and gives many varied tonal colours to pick from by just changing the relative levels of the two sounds. This method allows excellent tonal options in the mix for guitar recordings, without requiring an EQ (equalizer). In a more sophisticated set-up, you would plug the mics into a box called a pre-amp. This will amplify the MIC level signal up to LINE level, which an amp expects at it’s input. This is why it’s called a PRE-amplifier. It goes before an amp, boosting levels as needed to match the required input levels. People rave about certain preamps and dislike others. You really don’t need to waste money on fancy preamps unless you are getting serious about recording subtleties. The preamps in any interface will do fine. These days the quality is very impressive in even the cheapest boxes. There are countless varieties of preamp, but when you plug a mic into your interface, you’re using it’s internal preamp circuit to boost the signal to LINE level for sending to the DAW or your powered speakers. You won’t need to buy a preamp (the interface can do it) but probably you will want to add one at some point for more variety. Every mic signal requires a preamp, so the number of preamps you have available will affect how many mics you can record at the same time. Standalone mixer input channels that can be set to MIC all feature preamps too, for obvious reasons. Almost all signals leaving such a mixer are at LINE level. Vacuum tubes (or valves, if you’re European) are very popular in preamp designs, because they colour the sound in a flattering way, but also add noise. Solid-state preamps are cleaner, but less flattering and they sound colder. Always pick XLR cables if there is a choice, as XLR is typically a balanced signal and the 1/4″ jack may well not be. If the jack is balanced, it will have two black rings around the tip of the jack. If it has one, it is unbalanced. Balanced is quieter, with better rejection of hum or spurious radio interference. That makes for cleaner recordings. Take notes! It really helps. If anyone else is involved, it will help them. It may be old-school, but it works. If you return to a project later, a set of notes kept around will be a valuable aide-memoire. I open a paper file in my filing cabinet for each new project. It may even have legal benefits in a copyright dispute to have written records on file. Use the comments field in your individual tracks onscreen (check your DAW for note-taking and commenting possibilities) because you won’t remember later what you are currently well aware of as you record your song, and by note-taking you can be reminded at any time. That’s it for today! Tomorrow’s blogpost is called “Tools of the Trade: some cool things to consider adding”. See you then and happy recording! ADDENDUM: I assume here you already have an amp and speakers to listen through, or a powered speaker pair. I also assume you have a pair of headphones. For vocal recording, make sure your headphones are the closed type, so that the sound doesn’t spill from them into your microphone while you sing wearing them. “I say HA!” – How Brittany Kwasnik defied a doctor’s prognosis to find her voice. Hey Michael, Great to see you sharing your recording experience as a SAC guest blogger! “There are multitrack recording apps … for iPad… Garageband software comes free for this purpose.” – not really free @ $4.99 in iTunes.